Emma’s self-congratulatory “And have you never know the triumph of a lucky guess?” is my favourite line in the Jane Austin novel of the same name. It is also exactly how I feel about this cake. I love how a recipe slowly builds itself in your mind, and how triumphant you feel when you finally make your creation, taste it, and find it even better than you had hoped. The idea for this cake started out slowly. All I knew was that I wanted to make something using dried blueberries. For this month’s Tea Time Treats, a wonderful challenge run by Karen of Lavender and Lovage (host for November) and Kate of What Kate Baked, the theme was dried fruit; and I wanted to go beyond my usual currants (although I didn’t quite manage to escape that), cranberries, raisins, and dates. I had spied the container of dried blueberries at Whole Foods Market the week before the challenge was announced, and I immediately knew that I had to try making something with them. Then, for some reason, I latched onto the idea of combining the dried blueberries with red wine. I don’t know why. 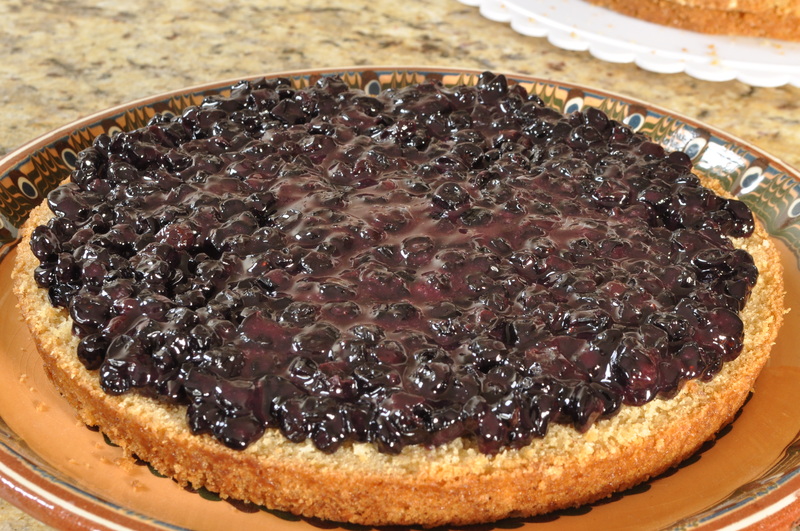 I can’t recall ever having eaten a dessert made with blueberries and red wine. My family thought the combination sounded a little strange. There was absolutely no reason why I should want to pair red wine with blueberries. Nevertheless, I was firmly committed to the idea. I daydreamed about it for hours, trying to envision the perfect vehicle for the compote that I had planned out. Along the way, oat streusel became attached to the concept. Streusel and red wine? That certainly sounded odd. Streusel makes a dish seem cozy and humble, while wine invokes elegance and romance. 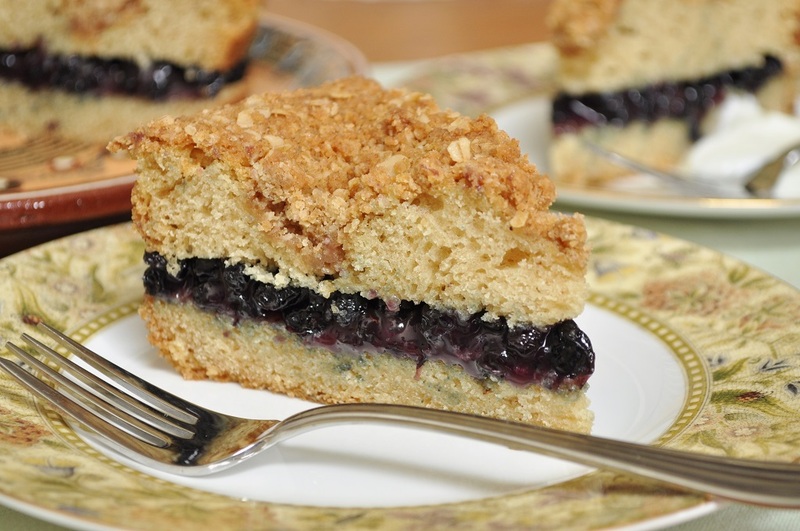 But I liked the idea of streusel with blueberries, so it was marked into the recipe blueprint. 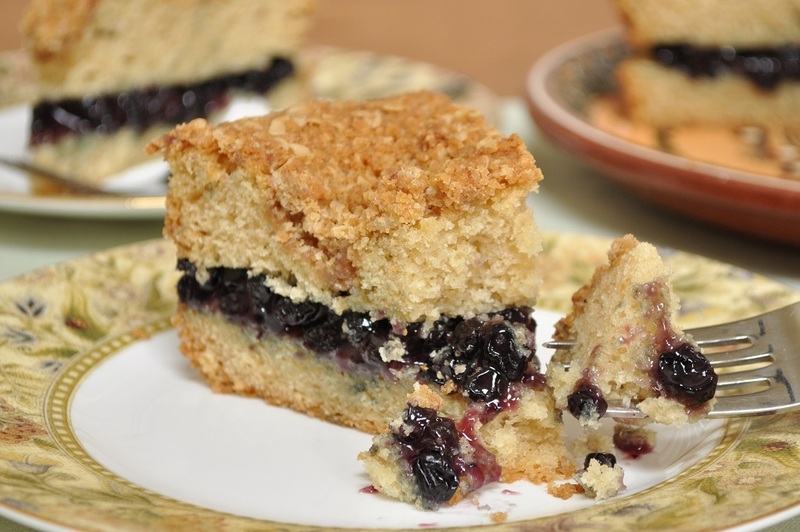 Streusel and dried blueberry compote. Should I make some kind of a bar cookie? Or perhaps a wintery crumble would be best. I couldn’t decide how I wanted to put them together. And then I suddenly felt the desire to make a cake. A beautiful, gold, buttery cake. Why hadn’t I thought of this at first? 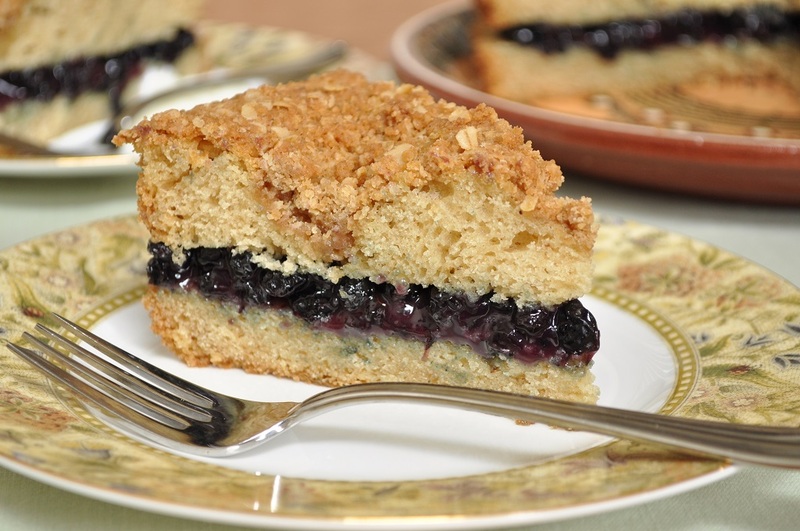 Blueberries and streusel belong in coffeecake. So I made this. A tender cake perfumed with browned butter and lemon, with crunchy, cinnamony streusel on top, and a ribbon of vibrant, sweetly tart compote running through the center. I would say that this recipe conclusively proves the triumph of a lucky guess. The combination of lush, fruity wine with dried blueberries is brilliant. It revives the fresh, bright taste of the berries, making it seem almost as if they had never been dried at all. 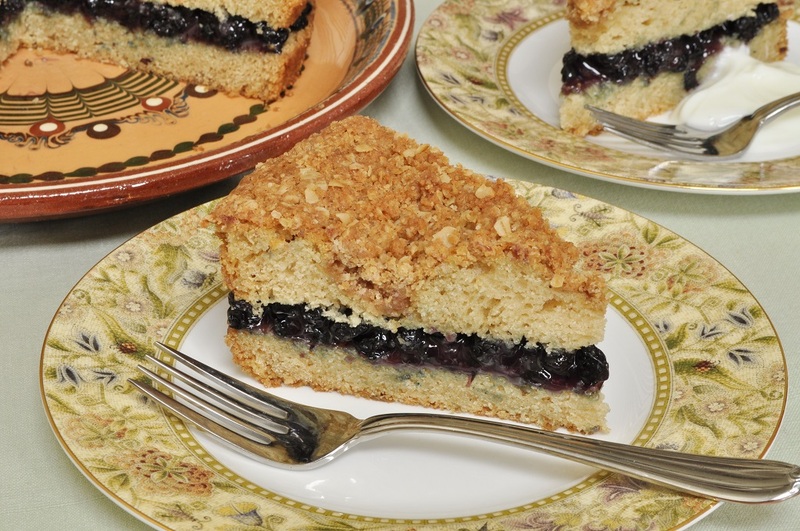 The juxtaposition of crumbly streusel and the sophisticated filling lends the coffeecake a refined complexity, one that would allow it to grace a party table, but still remain equally at home during a quiet brunch with the family. And I love the colours of the cake: the golden glow that the browned butter adds to the cake, the deep purple-blue of the filling. Ah, yes, I love the triumph of a lucky guess. Especially when it tastes so good. 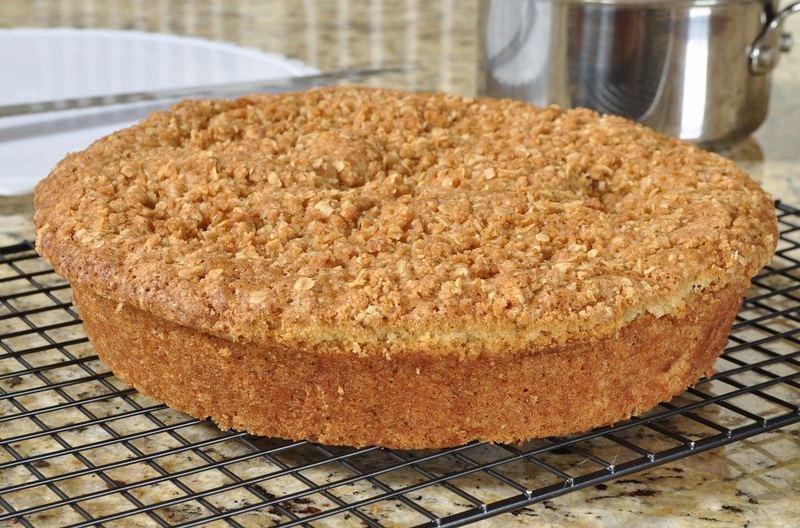 I am also submitting this cake, with its crunchy oat streusel, to Alphabakes, a monthly blogging challenge that is run by The More Than Occasional Baker and Caroline Makes. This month it is Caroline’s turn to host the event, and the letter selected was O. 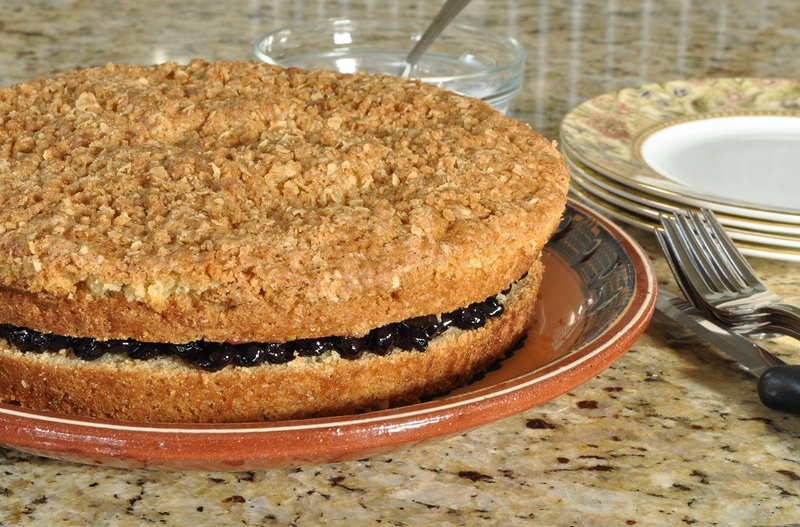 Note: Another eggless cake, indistinguishable in every way from ordinary coffeecake. This is a simple, unfussy recipe to prepare, but the result is lovely. Make the streusel topping first. In a small bowl, toss together the brown sugar, flour, cinnamon, and quick oats. Use your fingertips to rub in the butter until the mixture begins to form clumps. Set aside. Now you can start on the cake. Preheat the oven to 375°F. 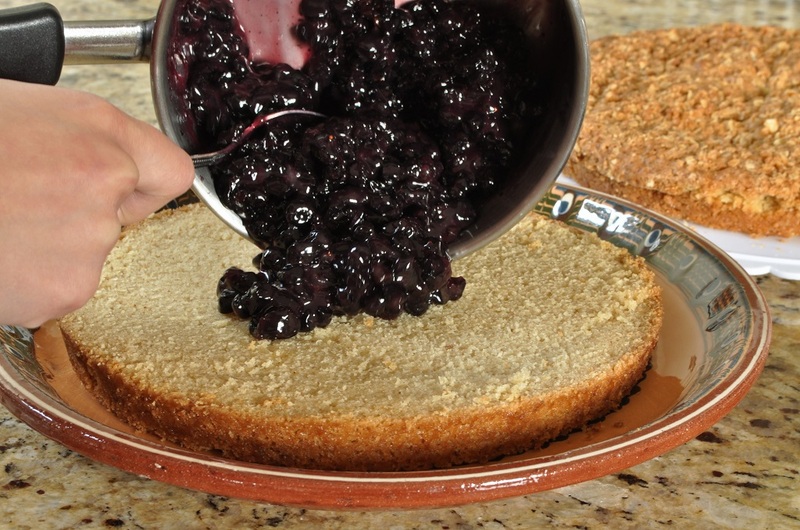 Thoroughly grease a 9-x-2-inch round cake pan, making sure to go all the way up the sides. Place the butter in a small saucepan over medium heat. Simmer until the butter solids have separated out and turned dark, and the butter is lightly browned and fragrant. Pour the browned butter into a liquid measure cup. You should end up with ⅜ cup, since the butter loses volume during the browning process. If you do have any excess, reserve it for another use—such as frying French toast. In a large bowl, whisk together the sugar, flour, baking powder, and baking soda. 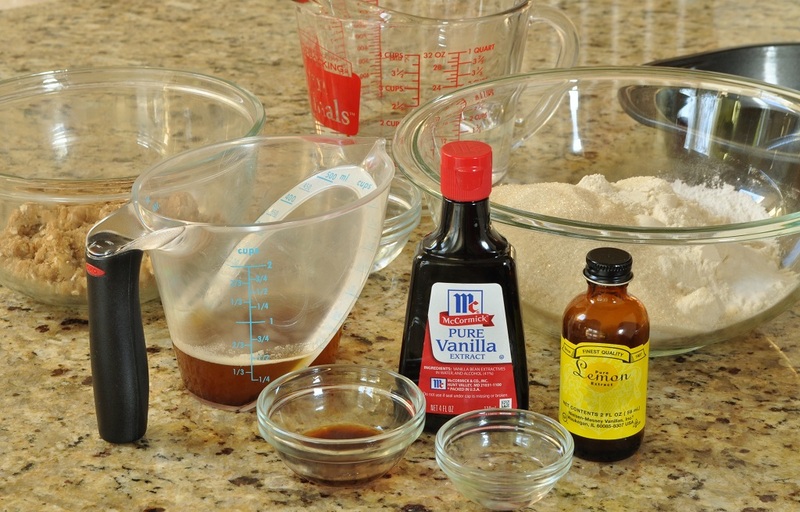 Add the vinegar, water, vanilla, and lemon extract to the measuring cup with the browned butter and mix well. Pour the liquid ingredients over the dry ingredients and stir just to combine. The batter should be very light and airy. Pour the batter into the prepared cake pan and smooth the top. Scatter the prepared streusel topping evenly over the batter, breaking up any large lumps with your fingers. You don’t want clumps any larger than hazelnuts, as they will be too heavy for the batter and sink into the cake. Bake the cake until the toothpick inserted into the center comes out clean, 30 to 35 minutes. Let the cake cool in the pan on a wire rack for 10 minutes. Cover another rack with parchment paper. Run a knife carefully around the edge of the cake and invert it onto the parchment-covered rack. Place the first rack over the inverted cake and then use it to flip the cake back over, so that the streusel side is facing up again. While the cake cools, make the filling. 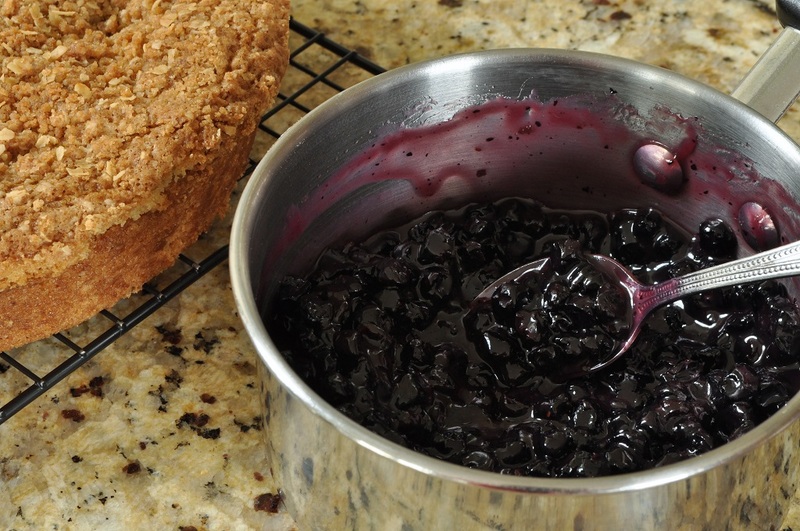 Mix together the dried blueberries, water, red wine, sugar, and flour in a small saucepan, making sure that there are no clumps of flour left in the mixture, and bring to a boil over medium heat. Boil, stirring occasionally, until the mixture is thickened and glossy, 3 to 5 minutes. Remove the pan from the heat and stir in the lemon extract. Let cool. Once both the cake and the filling are cool, use a serrated knife to slice the cake in half horizontally. Transfer the bottom half of the cake to a serving platter and spread the cooled filling over it, making sure to push it all the way to the edge of the cake. Place the top half of the cake over the filling and press down lightly to secure. A wonderful recipe! Do you develop all your recipes yourself? I will definitely have to keep an eye on your blog! Thanks for sending this one to Alphabakes as well. Thank you very much for your kind words, Caroline. I don’t develop every recipe on my blog myself. I like trying recipes from magazines and cookbooks, too; and when I find one that I particularly like, I blog about it. However, any recipe that does not have an attribution after the title is one that I have developed on my own. I think that I’ll have to create a section in my recipe index called “Lass In The Apron Originals” to clearly mark out the ones that are my own! Thank you, Karen. Your praise means a lot to me, because I admire your work so much. 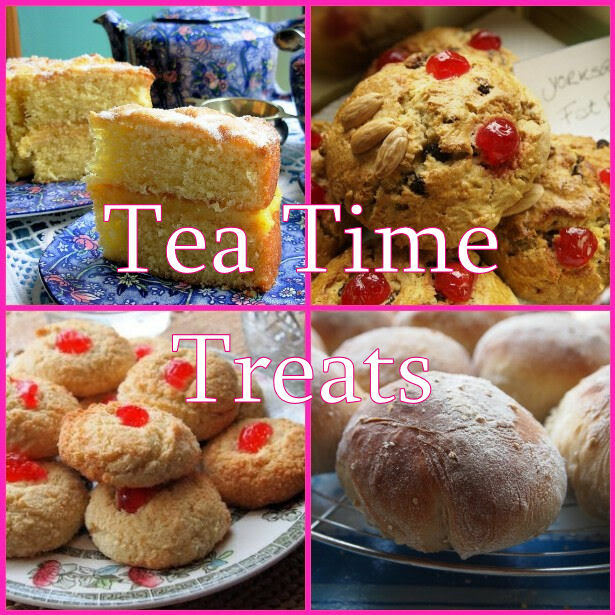 I really enjoyed the dried fruit challenge for Tea Time Treats–puts you right in the mood for the Christmas season!